Hibiscus are one of those evocative and exotic plants we tend to associate with holidays and warm climates. Looking very exotic, with their huge pollen laden anthers and two-tone flowers, they look delicate. However, with the syriacus Hybrids, nothing could be further from the truth. They are very hardy indeed down to -10C, and flower their socks off here in British gardens too. This fabulous collection of 3 colours is the perfect starting point too - great value and great quality plants. Great in large pots, or in mixed borders in full sun. They are hungry fellows, so give plenty of feed in the growing season, especially micro-nutrients (McDermotts Finest Fertiliser is ideal). You will be rewarded with fabulous summer spectaculars year after year. 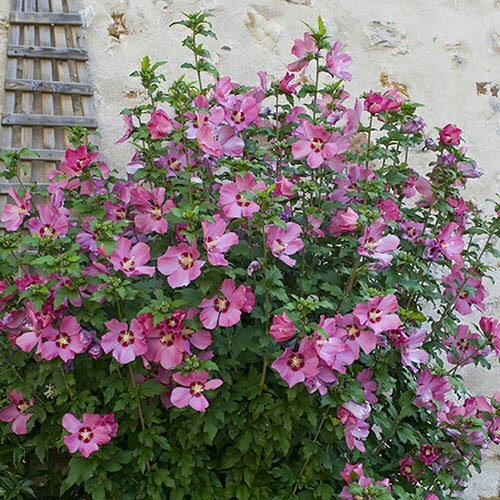 Supplied as a collection of 3 different named Hibiscus shrubs - pink, white and blue, all 2 years old 30cm tall in 2L pots, and ready to plant straight into the garden to flower this Summer.